When two titans — both long-time leaders of the longevity revolution — meet for a cup of coffee, what do they talk about? 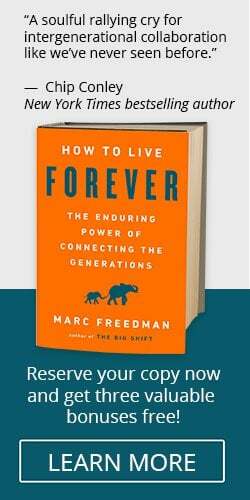 Over the course of an hour last month, Ken Dychtwald, founder and CEO of Age Wave, interviewed Marc Freedman, founder and CEO of Encore.org, on the upcoming publication of Freedman’s new book, How to Live Forever: The Enduring Power of Connecting the Generations. They talked about time, a father’s wisdom, the meaning of longer lives, the need to connect with younger generations — and superheroes. After decades of studying aging and longevity, Ken and Marc are both in their 60s now. In a way, the two are superheroes, fighting on the same side for longer lives with meaning and purpose, building a movement that will outlast them. Ken’s interview with Marc is one in a series of conversations Ken has had with thought leaders in aging, beginning in 1978 with his interview of Maggie Kuhn, founder of the Gray Panthers. Over the past 35 years, Ken has written 16 books on age-related issues, including his most recent, A New Purpose: Redefining Money, Family, Work, Retirement, and Success. Check out a handful of other, short video clips — and the full interview between Ken and Marc — here. The titans are talking — go ahead, be a fly on the wall!